Trailhead: 2701 E. Squaw Peak Dr.
Piestewa Peak is located in the Piestewa Peak/Dreamy Draw area of the Phoenix Mountain Preserve in Phoenix, Arizona. The Summit trail is how hikers make their way, gaining over 1200 feet in elevation, from the lower valley to the top of Piestewa Peak which is the highest point in the park. Those that haven't been in the area for awhile may remember the mountain by its former name of Squaw Peak. 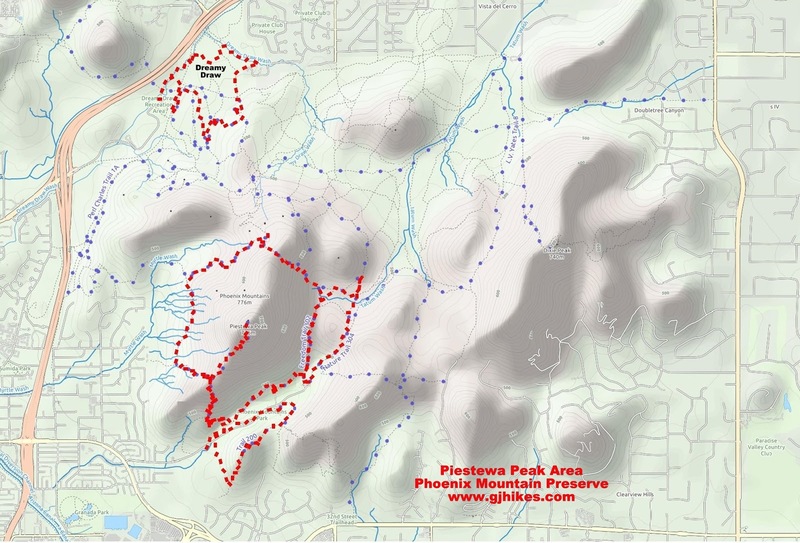 Several parking lots located along Squaw Peak Drive provide access to the Summit trail as well as other area trails. The actual length of the hike depends on how close you are able to park to the trailhead. The trail is easy to follow and has plenty of improvements making route finding a non issue. Switchbacks help to mitigate the steepness of the trail making the strenuous hike much more enjoyable. Several areas level off enough to give hikers a little respite. The scenery is pretty spectacular so if you have the time there is no real reason to hurry unless maybe you are trying to beat the heat. Much like the Hohokam would do it the trail builders took part of the mountain itself and made the wall lining the trail and the rock several benches for hikers to rest on. The rough bottom of the trail at this spot is also a nice touch. Some sections of the trail are much more primitive than others. They add a sense of adventure to the hike. If you get tired of the scenery on the side of the hill you are on, which isn't likely, don't worry. The trail passes through a notch in a saddle of the ridge and the hike continues up the west side of the mountain where downtown Phoenix comes into view. A pipe railing makes one of the steeper sections of trail near the summit a little more manageable. The summit of Piestewa Peak is one big mass of rock with enough room for a dozen or more people to rest and feel satisfied for making it to the top. Several pairs of chuckwallas provided a nice distraction on this outing. They say that when the chuckwalla feels threatened it will crawl into a crevice and inflate itself making it more difficult to be extracted by its prey. The female is more drably colored and blends in very well with the surroundings. People of all ages can be seen along the trail. Some are hiking and some are running. Not everyone looks to be in the greatest of shape but one thing you can count on is that if they keep it up they will be before long. Hikes like the Summit trail are great for the respiratory system and for building endurance. Having a trail as scenic as this so close to town makes the people of Phoenix fortunate indeed. If you would like to see it for yourself then all you have to do is 'Take a hike'.